Esteban Mira Caballos was born in Carmona (Seville), although he has lived in Extremadura since 1994. 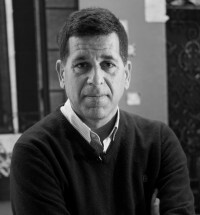 He has a PhD in American History from the Universidad de Sevilla, he is a corresponding foreign member of the Dominican Academy of History (2004) and the Chilean Institute of Genealogical Research (2012). His research focusses on the relations between Spain and America in the 16th century, as it can be stated in the publication of twenty-two books as well as more than a hundred collaborations in collective works, conferences and research journals in Spain, Germany, Mexico, Dominican Republic, Ecuador, America, and Chile.